The first, classified, edition of Factbook was published in August 1962, and the first unclassified version in June 1971. The World Factbook was first available to the public in print in 1975. In 2008 the CIA discontinued printing the Factbook themselves, instead turning printing responsibilities over to the Government Printing Office. This happened due to a CIA decision to "focus Factbook resources" on the online edition. The Factbook has been on the World Wide Web since October 1994. The Web version gets an average of 6 million visits per month; it can also be downloaded. The official printed version is sold by the Government Printing Office and National Technical Information Service. In past years, the Factbook was available on CD-ROM, microfiche, magnetic tape, and floppy disk. This category has independent countries, which the CIA defines as people "politically organized into a sovereign state with a definite territory". In this category, there are 195 entities. The Other category is a list of other places set apart from the list of independent countries. Currently there are two: Taiwan and the European Union. This category is for Antarctica and places in dispute. There are six entities. This category is for the World and the oceans. There are five oceans and the World (the World entry is intended as a summary of the other entries). Maps depicting Kashmir have the Indian-Pakistani border drawn at the Line of Control, but the region of Kashmir administered by China drawn in hash marks. The Republic of Macedonia is entered as Macedonia, the name used in its first entry in the Factbook upon independence in 1992. In the 1994 edition, the name of the entry was changed to the Former Yugoslav Republic of Macedonia, as it is recognised by the United Nations (pending resolution of the Macedonia naming dispute). For the next decade, this was the name the nation was listed under. Finally, in the 2004 edition of the Factbook, the name of the entry was changed back to Macedonia, following a November 2004 U.S. decision to refer to the country using this name. On December 16, 2004, the CIA added an entry for the European Union (EU) for the first time.) The "What's New" section of the 2005 Factbook states: "The European Union continues to accrue more nation-like characteristics for itself and so a separate listing was deemed appropriate." On February 28, 2008, the CIA added an entry for Kosovo, which declared independence on February 17 of the same year. Before this, Kosovo was excluded in the Factbook. 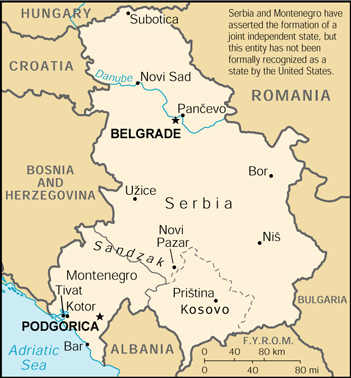 Kosovo is the subject of a territorial dispute; Serbia continues to claim Kosovo as part of its own sovereign territory. Kosovo's independence has been recognised by 108 out of 193 United Nations member states, including the United States. Various demographic information is full of usually minor errors, inaccuracies, and out-of-date information, which are often repeated elsewhere due to the Factbook's widespread use as a reference. For example, Albania was until recently, described in the Factbook as 70% Muslim, 20% Eastern Orthodox, and 10% Roman Catholic, which was based on a survey conducted in 1939, before World War II; numerous surveys conducted since the fall of the Communist regime since 1990 have given quite different figures. Another example is Singapore, which the Factbook states has a total fertility rate of 0.78 children per woman, despite figures in Statistics Singapore which state that the rate has been about 1.2–1.3 children per woman for at least the past several years, and it is unclear when, or even whether, it ever dropped as low as 0.78. This low and inaccurate value then gets cited in news articles which state that Singapore has the world's lowest fertility, or at least use the figure for its shock value. ↑ Miller, Jill Young. "CIA puts data on the internet." Fort Lauderdale Sun-Sentinel 12 December 1994. ↑ For an example of a redirect, see what happens with the profile for Kingman Reef. ↑ For an example of a redirect, see what happens with the profile for Juan de Nova Island (mirror). ↑ For an example, see the profile for the FRY in the 1999 World Factbook. ↑ Statistics Singapore – Latest Data. Singstat.gov.sg. Retrieved on 2014-04-28. ↑ Richard Collin & Pamela L. Martin. An Introduction to World Politics: Conflict and Consensus on a Small Planet (Rowman & Littlefield, 2013), p. 41. This page was last modified on 1 January 2016, at 22:09.